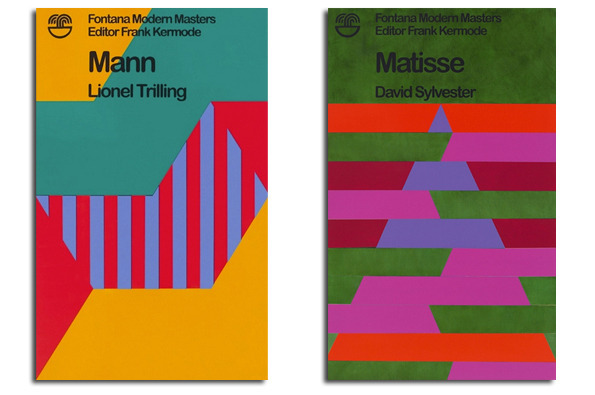 For many people, the Fontana Modern Masters series provided an introduction to philosophy, critical theory and assorted other aspects of twentieth century thinking. 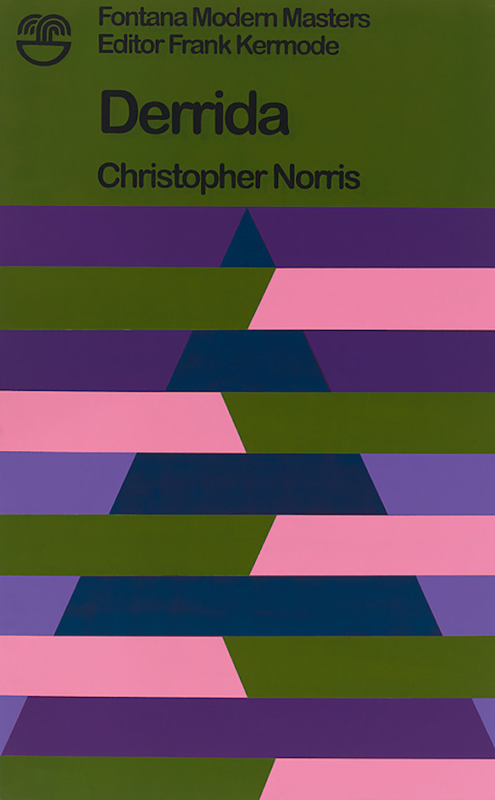 The books, first published in the 1970s sand early 1980s were portable and cheap and the colourful geometric designs on the covers made them easy to spot. I know a trawl of my bookshelves would yield a few; certainly Bryan Magee’s Popper helped me through philosophy of science one of the few bits of my physics degree I properly enjoyed (yes, that’s right, physics; and no, I have no idea what I was thinking either). So, why am I writing about some book covers from several decades ago now? Well, I’m not really, expect as a bit of background on the matter in hand: Jamie Shovlin’s Various Arrangements which I caught recently – somewhat by accident and on the last day – at Haunch of Venison. 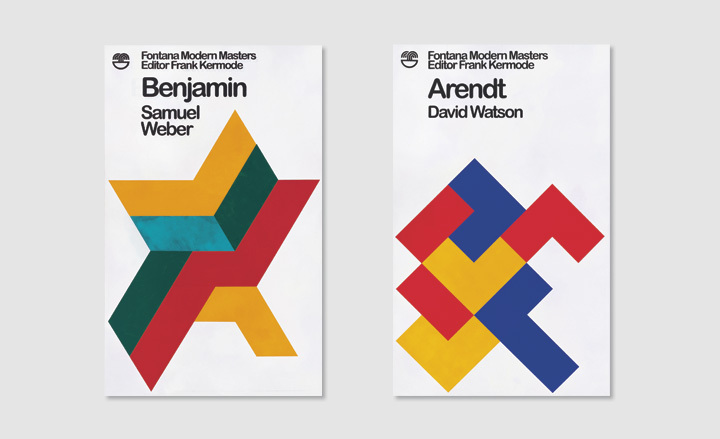 In a project that started several years ago, and which was shown in an earlier incarnation at Riflemaker in 2005, Shovlin analysed the covers of the Fontana Modern Masters series using his own, somewhat arbitrary system and used his findings to work out how the covers might have looked for other books scheduled to appear in the series but which didn’t appear with the geometric cover designs. Initially he made small watercolour paintings of the missing covers but has now moved on to large canvases. The show at Haunch of Venison brought these different elements together in an installation that included the materials – in terms of both research and art materials – Shovlin used to create the series. The notion on scoring great minds is an intriguing one and accordingly the strange hierarchy that Shovlin’s system throws up is fascinating. 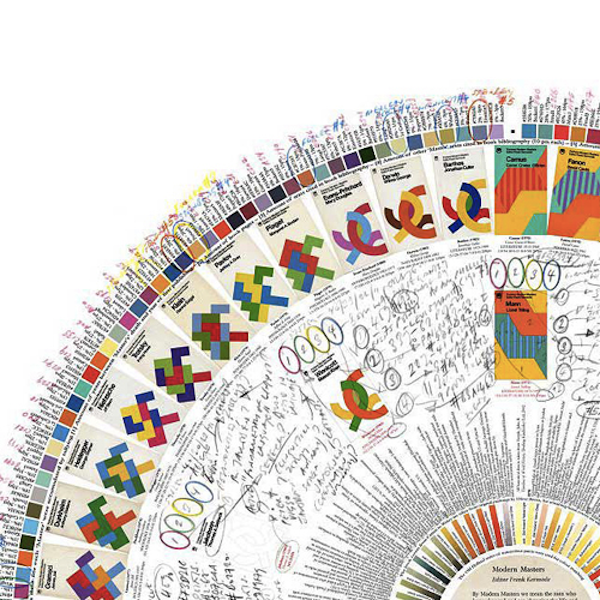 The subject of each published book gets a score – poor old Karl Popper comes in with a paltry 125 to Sigmund Freud’s 632 which could perhaps be seen as neatly demonstrating that Sovlin’s approach is anything but an exact science – determined by factors like whether or not they won a Nobel Prize, the number of pages there are in their Fontana Modern Masters book and how many others in the series are referenced in it. By applying this system, Shovlin generated possible covers for each of what he saw as the ‘missing titles’ which become the basis for the large paintings. 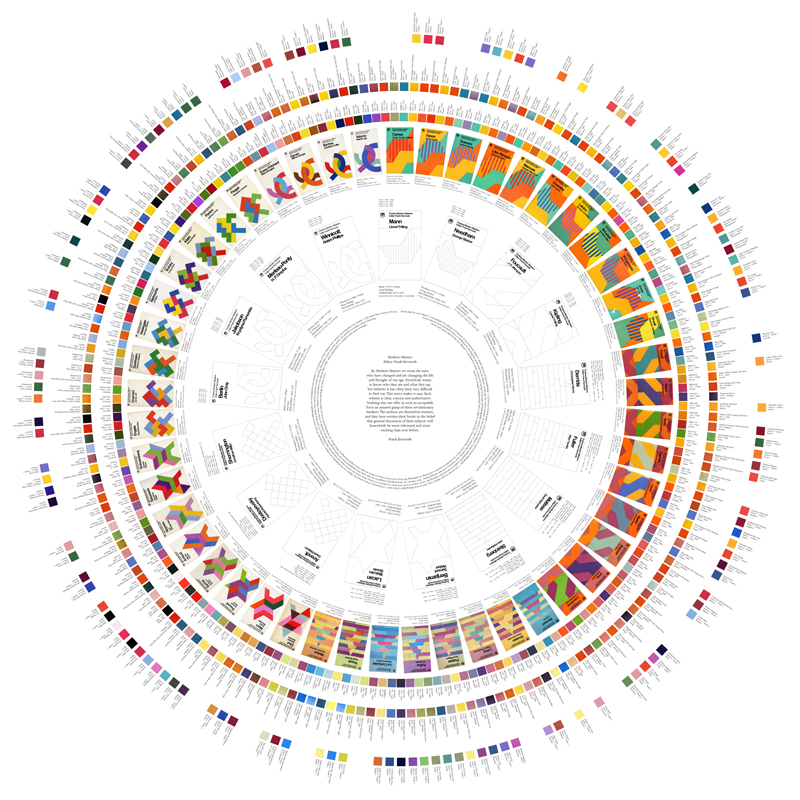 For each title there are several variations; Shovlin layered the different options on the canvas so that other possibilities are hinted at by a slight disruption to the surface. At first sight this evidence of previous versions seems odd, after all if the system has generated the cover why the imprecision? In allowing the system to generate options from which he then chooses, Shovlin is following a process that those who commission book jackets would presumably understand well and though I was ambivalent about the approach, I think I’ve gradually come round to it and I’m pretty sure that it make the paintings hold my attention for longer. 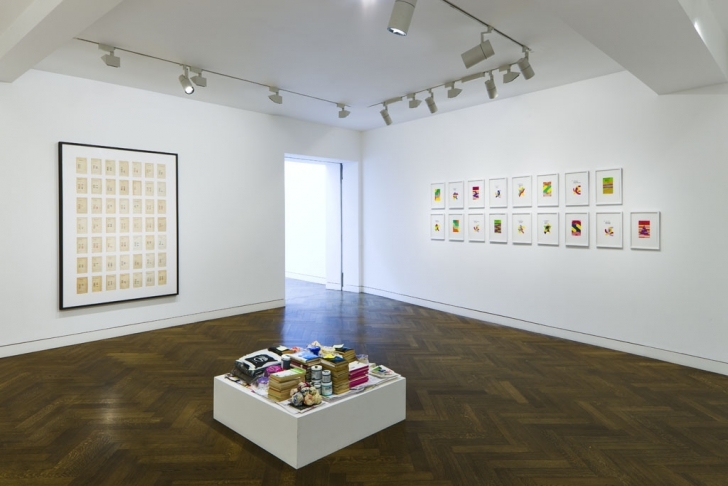 Jamie Shovlin: Various Arrangements was at Haunch of Venison, Bond Street, London W1 from 18 April to 26 May 2012. This entry was posted in Ideas, Painting, Theory and tagged Arendt, art, Benjamin, book covers, colourwheel, cover design, Derrida, Fontana Modern Masters, Jamie Shovlin, Mann, Matisse, painting, Various Arrangements by Ann Jones. Bookmark the permalink.